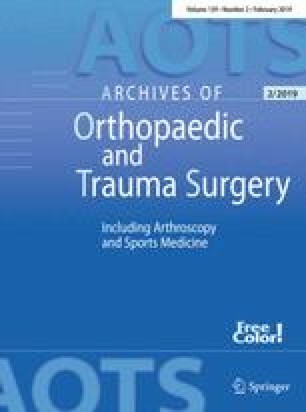 Arthroscopic treatment of tibial plateau fractures were compared with open traditional methods retrospectively. Twenty-eight patients were included in this comparative study based on fracture patterns and divided into two groups. Using Schatzker's classification system, patients with type II (split depression), type III (isolated depression) fractures, or other fracture types were included. Nineteen of these patients were treated by arthroscopically assisted management (group S), and the remaining 9 underwent the conventional open method (group O). There was no significant difference between both groups in terms of duration of operation, postoperative flexion, and clinical results. In group S, however, the postoperative rehabilitation was easier and faster (the time to obtain 120° of flexion was 4.6±3.9 weeks in group S, 9.1±8.6 weeks in group O). Furthermore, 16 of 19 patients (84%) in group S obtained an anatomical reduction (defined as <2 mm of residual displacement after surgery), whereas in group O, only 5 of 9 patients (55%) had an anatomical reduction. Also, accurate diagnosis and treatment of any associated joint pathology was possible with arthroscopic management. The arthroscopic procedure is recommended in selected tibial plateau fractures.